Who is Bhai Daya Singh Lahoria ? Bhai Daya Singh Lahoria has been incarcerated in Tihar Jail Delhi since 1997 and is the co-accused in the same case as Professor Devidnerpal Singh Bhullar. His wife, Bibi Kamaljeet Kaur Lahoria spent over 11 years in prison and has still a case pending in Calcutta. The Sikh Organization For Prisoner Welfare have been supporting both Bhai Daya Singh Lahoria and Bibi Kamaljit Kaur, by providing monthly support, prisoner welfare, medical aid and paying for the legal aid (bail, lawyers etc). 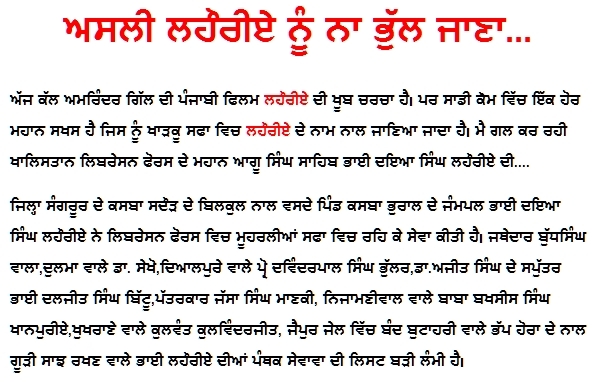 ੲਿਸੇ ਤਰ੍ਹਾਂ ਭਾੲੀ ਜਗਤਾਰ ਸਿੰਘ ਹਵਾਰਾ ਨੂੰ ਲਗਾਤਾਰ ਬੰਦ ਰਖਿਅਾ ਜਾ ਰਿਹਾ ਹੈ ਤੇ ਜੇਲ ਨਿਯਮ ਅਨੁਸਾਰ ਮਿਲਦੀ ਤਿੰਨ ਘੰਟੇ ਦੀ ਖੁਲ ਨਾ ਦੇਕੇ ਬਣਦੇ ਮਨੁਖੀ ਹੱਕਾ ਦੀ ਘੋਰ ੳੁਲੰਘਣਾ ਕੀਤੀ ਜਾ ਰਹੀ ਹੈ !